A photo tutorial on how to make almond butter. 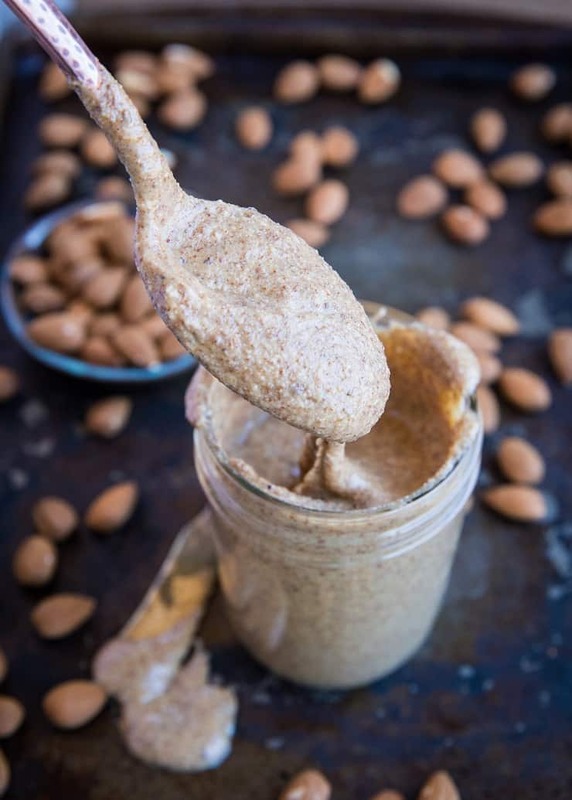 Homemade almond butter is absolutely delicious and only takes 25 to 30 minutes to prepare! Have you ever made almond butter? 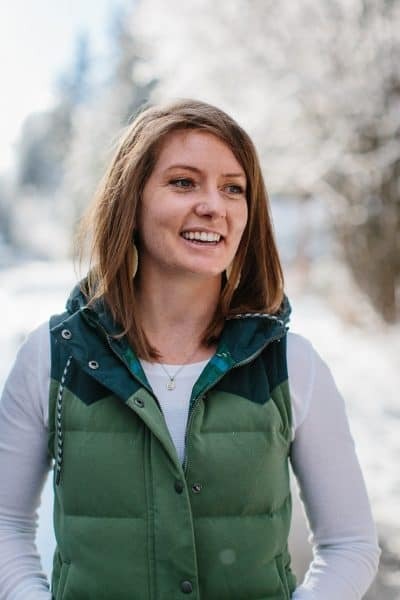 If you’re a hippy like me and you enjoy having control of everything that goes into your body, homemade nut butter may just be your new next thing (if it isn’t already). 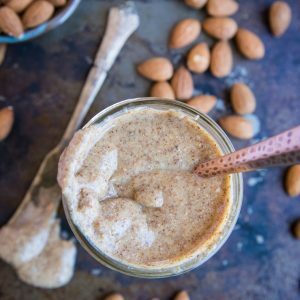 What Do I Need to Make Almond Butter? All you need to make homemade almond butter is raw almonds. You’ll end up roasting the almonds, but I do recommend starting with raw and roasting them yourself. It only takes 10-15 minutes to roast them, and the flavor turns out so fresh and delicious. You will also need a food processor and 20 to 30 minutes of time. Simply put, you’re in complete control. When you buy almond butter from the grocery store, be sure to read the label to be sure it only contains almonds (or almonds and salt). Many almond butters contain additional oils, sugar, and sometimes preservatives to increase shelf life. The purpose of these additives is to create a shelf-stable product that is appealing to the eye and enhances the flavor. I find homemade almond butter using raw almonds that I have roasted to be THE BEST tasting almond butter out there. I don’t add salt or sweetener, but you absolutely can if you’d like. Plain and simple: homemade almond butter tastes fresh, real, and once you try it, you’ll never go back to store-bought. Many people sweeten their homemade almond butter with pure maple syrup, honey, erythritol, stevia, etc. You can absolutely follow suit! Plus, you can also add cacao powder, ground cinnamon, vanilla extract, instant coffee granules, and more, to flavor your nut butter. Can I Do This With Other Nuts? Absolutely! 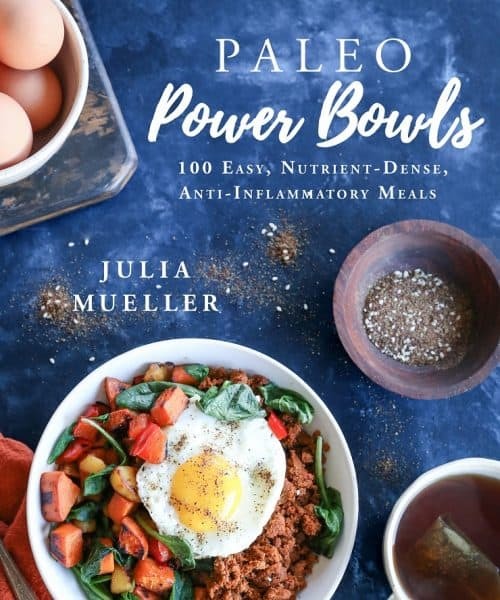 You can use a slew of nuts. My favorites in addition to almonds are cashews and walnuts. You can also use pecans or peanuts. In fact, I plan on showing you a tutorial on homemade cashew butter soon. Preheat your oven to 350 degrees F and spread 2 cups of raw almonds on a baking sheet. Bake for 10 to 15 minutes, until almonds appear puffy and are deep brown. 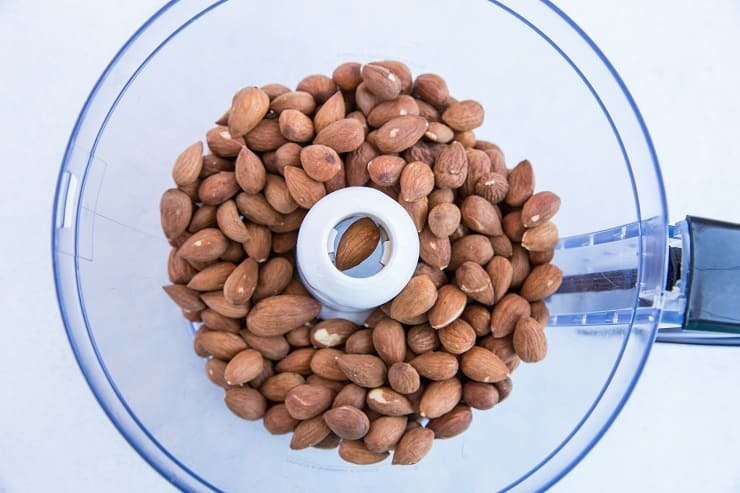 Remove almonds from the oven, allow them to cool, then transfer them to a food processor. 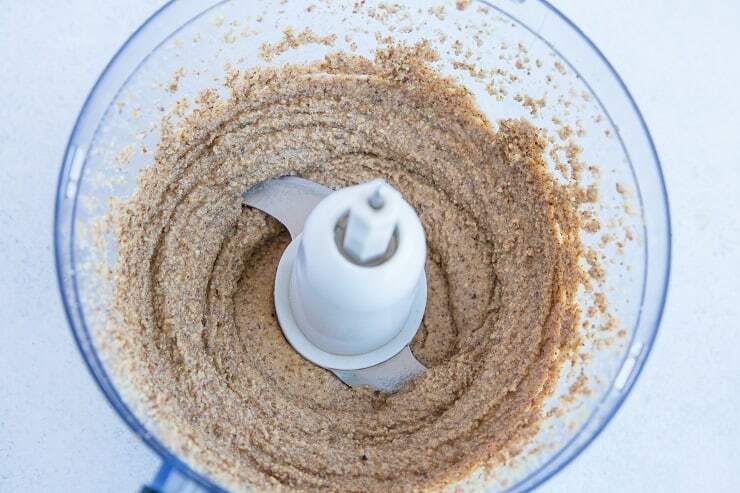 Start your food processor and keep it going until a coarse meal forms. 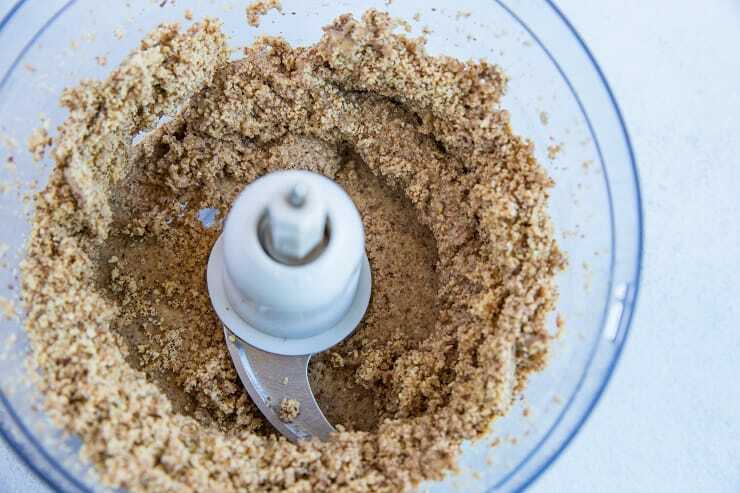 Once a meal has formed, you’ll want to stop the food processor, scrape the sides with a rubber spatula, and keep going. Continue processing until the almond butter reaches your desired consistency. I like my almond butter fairly gritty, so I usually process mine for about 4 to 5 minutes. 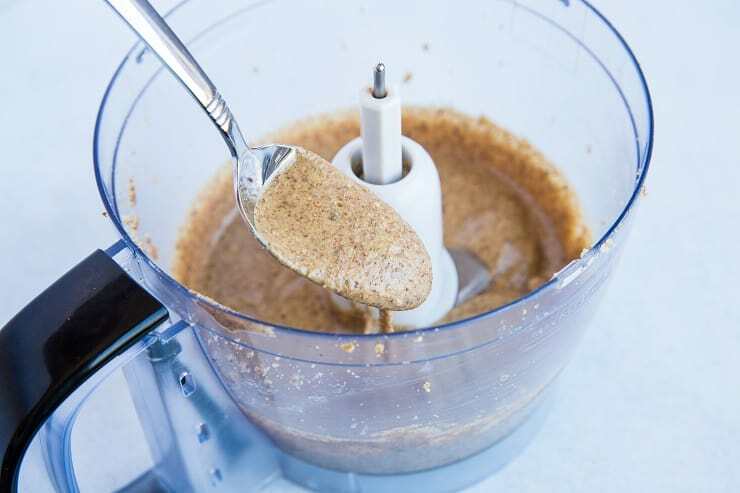 For smoother almond butter, continue processing for 10 to 15 minutes. And that’s it! Store your almond butter in a sealable jar in the refrigerator and enjoy on toast, sliced apples, by the spoonful, on pancakes, you name it! Let me know if you try it! 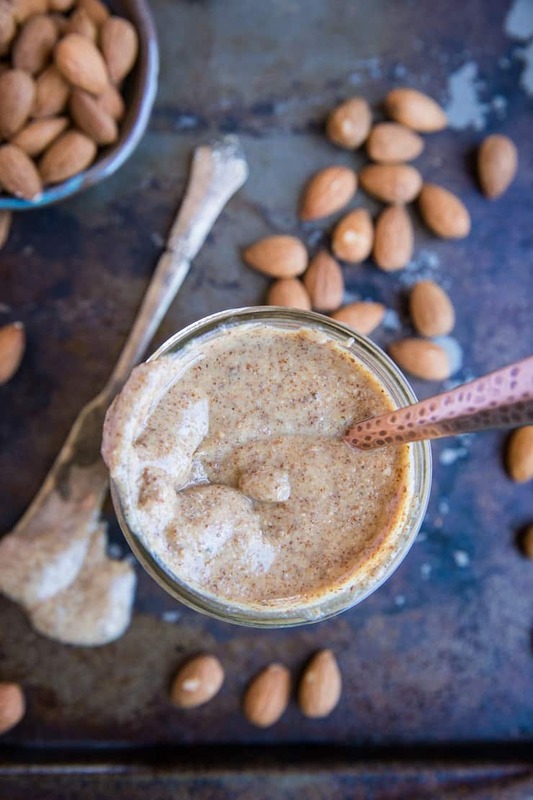 I hope you love homemade almond butter as much as I do! 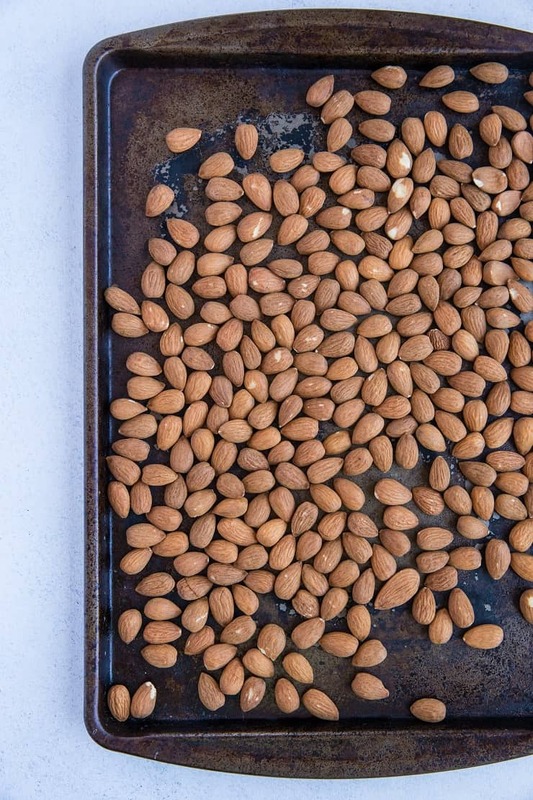 Spread the almonds over a large baking sheet. Bake 10 to 15 minutes, or until almonds appear puffy and deeply golden. Remove from oven and allow almonds to cool. 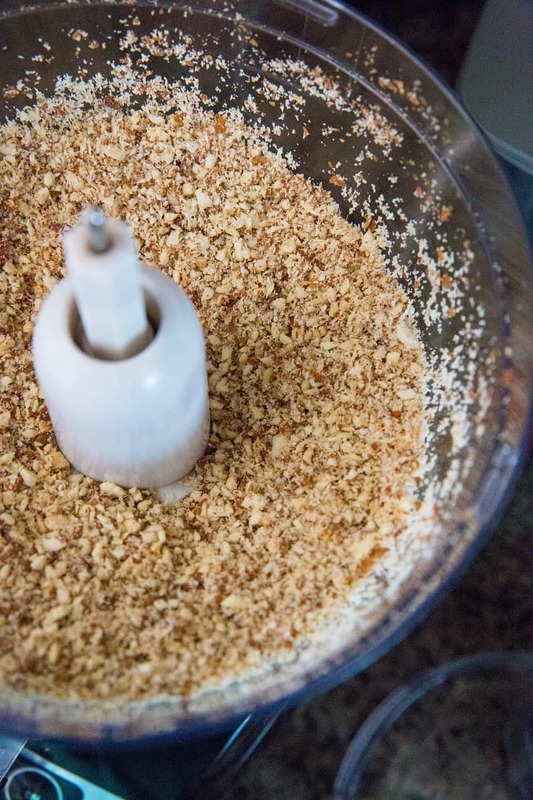 Transfer roasted almonds to a food processor. Process until a thick paste forms. 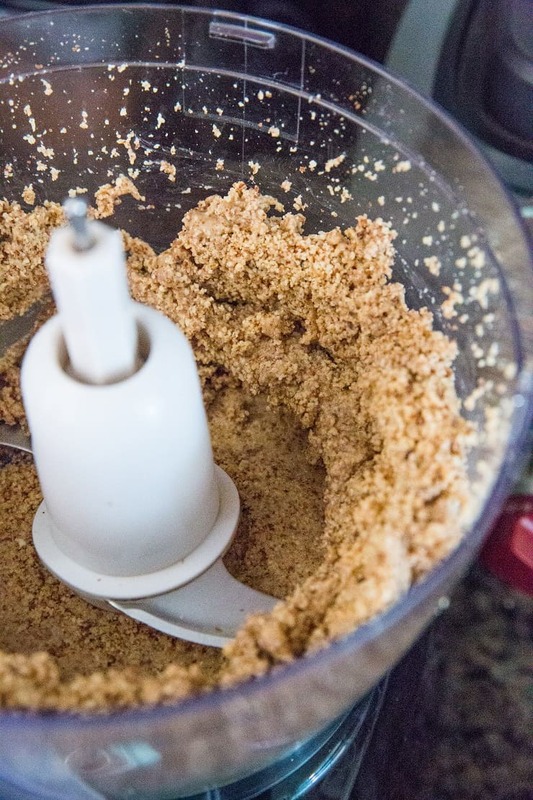 You'll likely need to stop the food processor to scrape the sides to help move it along. Continue processing until your desired consistency is reached. For grainy almond butter, process 5 minutes. 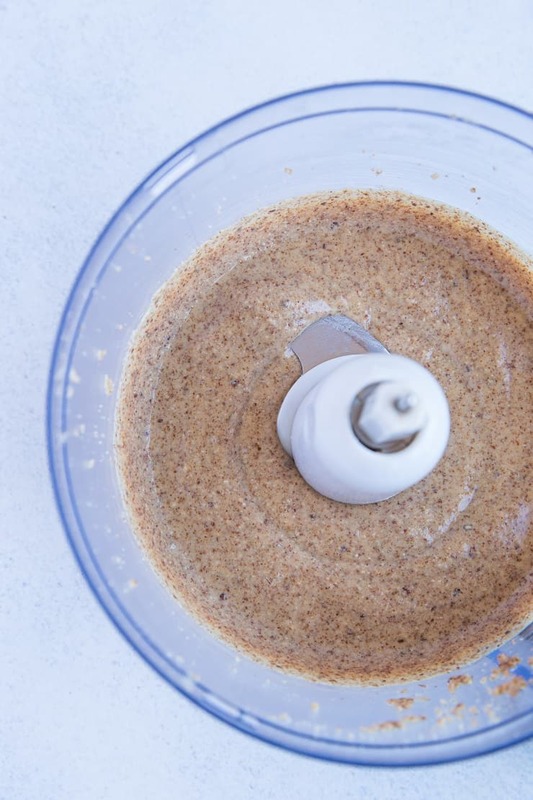 For smooth and creamy almond butter, process 10 to 15 minutes. Transfer almond butter to a sealable jar and refrigerate. Keep for up to 2 months. Do you need to soak the raw almonds for 8 hours prior to roasting them, to get rid of the phytic acid that inhibits nutrient absorption? I have been making this for several years now…I agree with you to start with raw almonds and toast what you need…I think toasting till slightly brown(maybe too the limit before burning) is the best…however be careful as this is a fine line…blend yo your desired thickness and enjoy…especially in the fall with fresh apple harvest..wow!! I’ve been making it for ages as well. Definitely roasting makes a deeper flavor. You don’t even need any sugar as it’s sweet enough. Do you think this the food processor is a better way than a High speed blender such as a Vitamix?